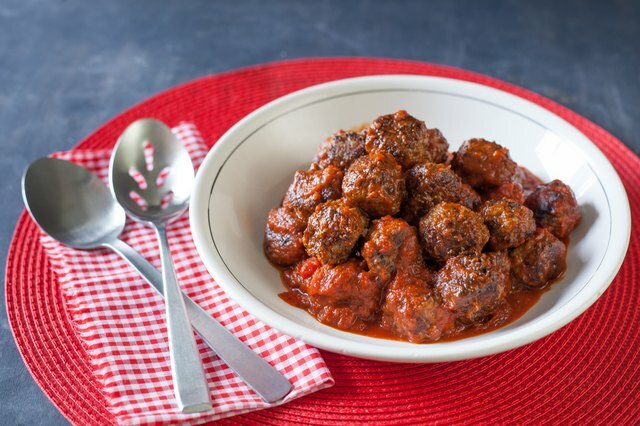 Meatballs can be added to tomato sauce to create an appetite-pleasing meal. But sometimes meatballs can be easier to eat, than they are to make. 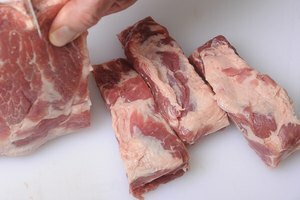 Unless you know how to prepare them correctly, you may find they fall apart easily during the cooking process. Getting meatballs to stick together and stay together during cooking is easy — you just have to know how. Adding one simple ingredient and preparing the meatballs before they go into the sauce makes all the difference in keeping them together. 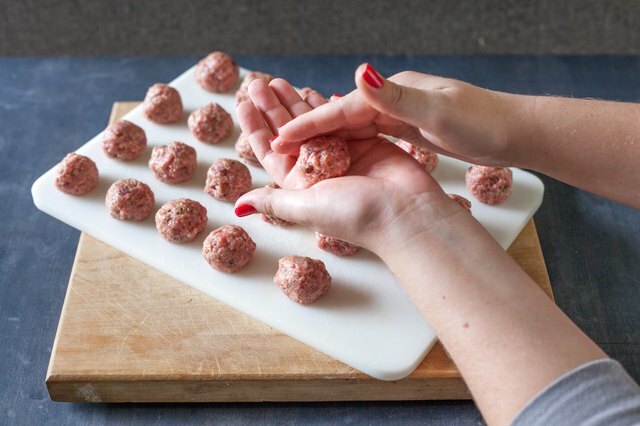 So don't fret, you will be making meatballs like a pro after you learn the secret. 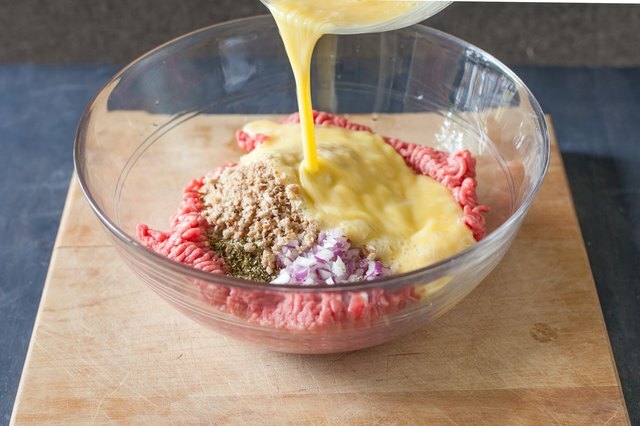 Place ground beef into a mixing bowl. 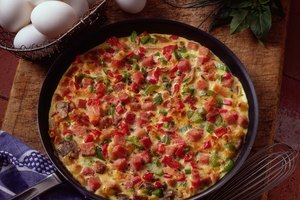 Create a well in the middle of the beef and add the diced onion, garlic, spices, bread crumbs, milk and lightly beaten eggs into the well. Mix all the ingredients into the ground beef. Hands are the best tools for this process. If the ground beef mixture seems a little too wet, add a 1/4 cup of breadcrumbs. The mixture should be moist but not soggy. The egg will help hold the meatballs together. Roll a small amount of ground beef mixture between two palms. Roll until a firm, round ball is created. Place the meatball on a platter and continue rolling the rest of the ground beef mixture. Coat the frying pan or bottom of a large pot with olive oil and heat on medium high. When the oil is hot, place the meatballs into the frying pan or pot. Brown on all sides of the meatballs. Use a spatula to turn the meatballs. 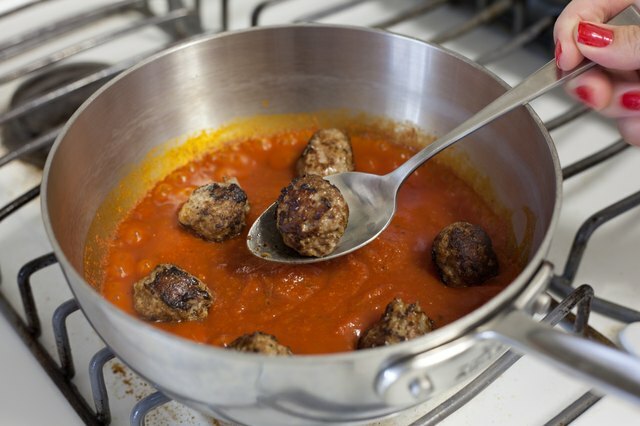 Carefully scrape the bottom of the pan or pot so the meatballs come loose easily and do not break apart. Place the meatballs into a roasting pan coated with oil. This is an easier way of browning the meatballs without the mess. 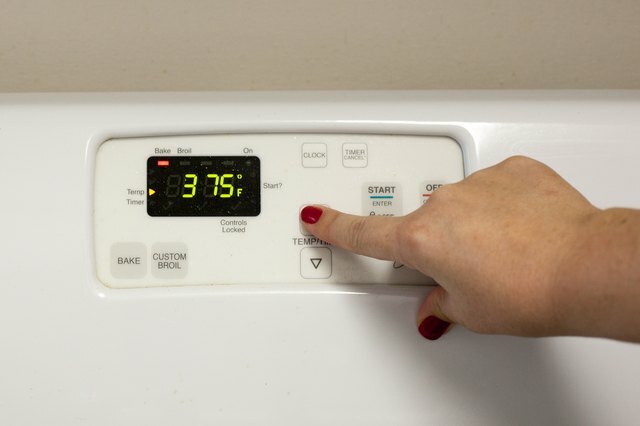 Place the roasting pan into a 375 degree Fahrenheit oven. After 15 minutes, turn the meatballs over and cook for another 15 minutes or until the meatballs have browned. Add the browned meatballs to the tomato sauce and cook for an additional 20 minutes. The flavor of the meatballs will meld into each other. Gently stir the sauce every few minutes to keep the meatballs from sticking to the bottom of the pan. Raw meatballs should never be added to the sauce, they will fall apart easily. 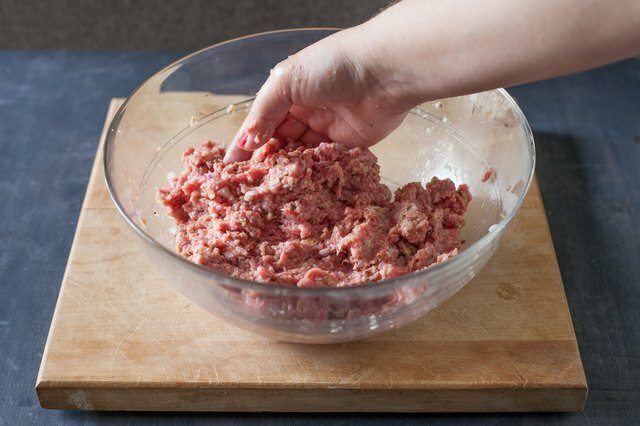 Browning will help the meatballs stay together and give them extra flavor. Jodi Buttarazzi has been writing professionally since 2008. She has contributed articles and content for online publications such as Merchant Circle, drawing on her experience of food and wine owning and operating a fine-dining restaurant in Houston. She is pursuing a career in the health-care industry and is working toward a Bachelor of Science in health-care management at the University of Phoenix.